Men’s fashion has fallen hard for sneakers, and that means it’s totally acceptable to wear your favourite pair everywhere (well, nearly). But for style’s sake, not all sneakers are created equal. From contemporary designers to heritage luxury brands, here are the 10 best new sneakers to kick around in 2018—and earn you some street cred. Chunky and white are two design elements taking over sneakers in 2018. With everyone from Adidas to Fila doing it, Joshua Sanders is one of the freshest indie luxury brands offering all-over white. In calfskin leather and an EVA midsole, this Zenith high-end chunky number is as comfortable as it is cool. What do you get when an avant-garde Japanese designer collides with an American sneaker icon? Hot pink kicks, that’s what. The Nike shoe has been totally transformed by Comme Des Garcons Homme Plus, but retains the Air Max 180’s signature shape and retro style points such as the red Nike tick. Take your sneaker game to new heights with a pair of hi-tops. Dior Homme offers its classic B23 skater model in a technical canvas this season. And, in a very wearable black and white colourway, the splices of red and tribal-print lace are luxury lashings that reflect the elegant edginess that is Dior. The anticipated sneaker collab between Raf Simons and Adidas Originals returns, and it’s galaxies apart from the previous Stan Smith redesign. The brainchild of the Belgian designer and German sports brand, this Ozweego III model comes colour-blocked and two-toned—purple and black—with patent leather panels, technical mesh in parts and a split rubber tread that makes walking look, and feel, otherworldly. If you’re more of a boot guy, or the balk at the casualness of sneakers, then brave the Jaw trainer from Givenchy. Combining nylon, leather and knit, the molten black hi-top shoe comes with a chunky shark jaw-sole. Like a Chelsea boot, it’s lace-less. Just slip on the knit sock and zip up the front. 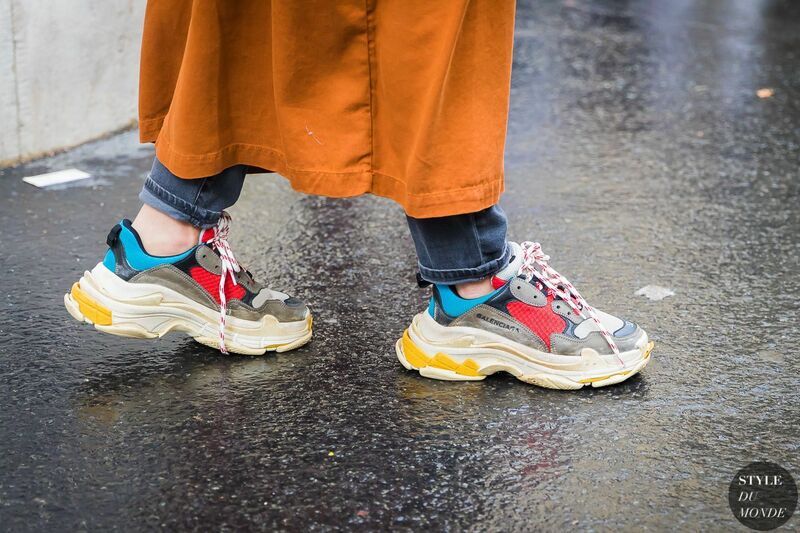 Balenciaga has brought out one of the most coveted sneaker models for 2018: the Triple S. Now helmed by Soviet streetwear designer Demna Gvasalia, the Parisian label’s latest sneaker pioneers the chunky sneaker normcore trend, and is made from a mish-mash of materials like distressed nubuck and mesh and an assortment of colours. Best invest in this one, it’s going to be a cult classic. One of the comfiest kicks to launch this year, designer Sarah Burton’s runner sneaker is super wearable. Combining smooth leather and velvety grey suede set on a bouncy, rubber role, the metallic panels make this model feel more Alexander McQueen, matching the silver logo embossed on the tongue. Inspired by the glam rock gods of the 80s, Gucci’s Rhyton model takes a metal turn in 2018. Designed in all-over white, the not-so-clean distressed leather look is set a 2-inch chunky sole and is distinctively ‘Kiss’ with a red-lipped flicky tongue print. If Gene Simmons wore sneakers, these would be it. Since 2004, contemporary sneaker savant Common Projects has been paving the way for the rakish man wanting a sophisticated casual shoe. For 2018, the New Yorker’s BBall style is constructed—in Italy—from smooth suede and lined in soft leather. The streamline shape and cut of the sneaker remains, making this style perfect for tailoring. If you missed the latest Off-White X Nike Air collaborative drop (that literally flew off the shelves this month), then cheer up, this 90s high-tech basketball kick will do the trick. In grained leather, suede and rip-stop fabric, the white high-top model features cool industrial designs—a detachable yellow and black logo Velcro strap and orange safety tag—markings of Virgil Abloh’s high-end utility streetwear aesthetic.